Its always a good sign when we see one Business VoIP or UC provider joining forces with another provider. But an even better sign is when we see the major powerhouses of an entire industry team up with a Unified Communications provider. These partnerships are generally responsible for spawning new innovative solutions, and pushing Cloud Communication adoption in new ways. And, as it turns out, it looks like Jive and Cisco are about to just that. Following their initial partnering back in 2014, Cisco and Jive Communications just went ahead and announced the latest update in this saga. The Cloud Communications provider, and Systems giant that is Cisco, are teaming up to form a new Unified Communications Partnership. To sum it up quickly, this partnership in the end will enable simple, seamless adoption of the existing Jive Cloud Voice and UC through new Cisco Multiplatform Phones. So in order to unpack the announcement, we need to understand exactly what this new partnership will bring. But, more importantly, to put everything in context we’ll take a look at just how this recent development will benefit existing users, and how it might encourage new users to jump on board with Jive’s platform. Well, as Jive explains, thanks to this partnership, they are now the first UCaaS provider in North America to bring this support to the table. So essentially, the big news here is that Cisco’s newest multi-platform phones now support Jive’s communication platform. So that sounds great and all, but you might be wondering, what even is a Cisco Multiplatform Phone, why does my team need it, and what about my old desk phones? 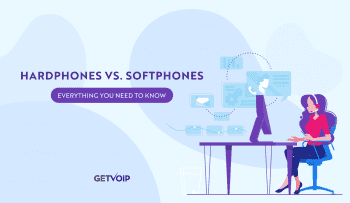 Well, first things first, if your team isn’t currently using Cisco phones, maybe you have a popular alternative like Polycom phones, or even a lesser known name like Vtech. Or, chances are, you might even have some proprietary phones like Mitel’s own. 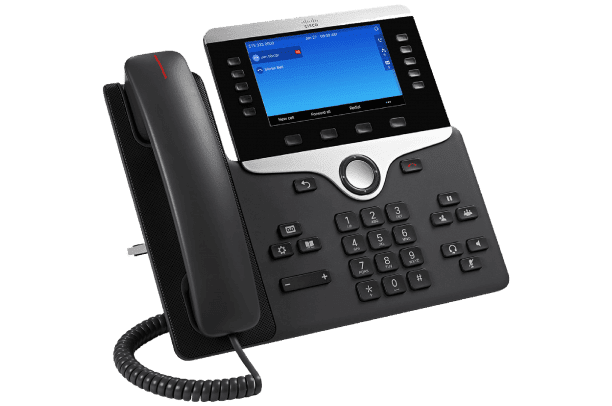 In fact, just like those new Mitel phones we took a look at, the Cisco 8800 series is capable of integrating directly with your personal smart phones, perhaps one of the more important key features new to Jive users. 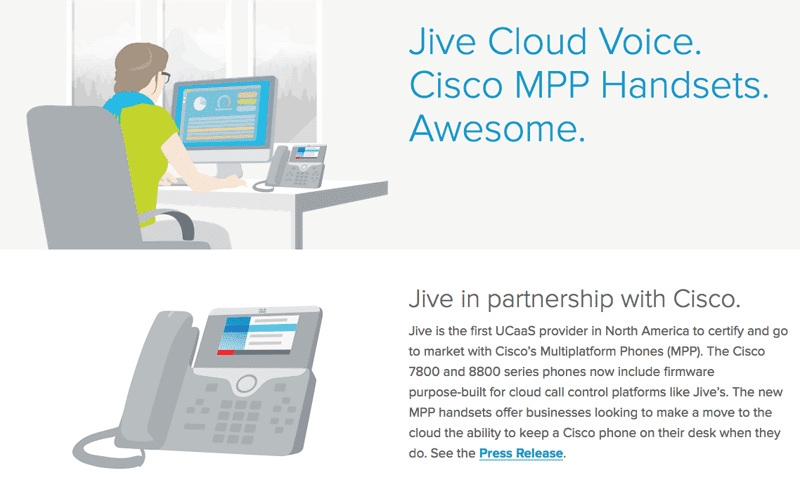 So, the main focus point here is that now Cisco phones can be used with Jive, which opens up service to an entirely new user base. Or, alternatively, will allow existing users to swap out otherwise budget phones for high quality Cisco phones. So, this announcement wasn’t surrounding any new phones introduced by either provider. But, Cisco is always updating their products, and 8800 series include some of Cisco’s most high-tech phones. While the 7800 series might be more on the basic side, they’re still incredibly capable desk phones, and certainly not on the budget end. But for the 8800 series, Cisco brings to the table HD color displays, and the ever-so important ability to integrate with your personal smart phones, as I mentioned before. This brings Jive offerings even up to part with what Mitel has pushed out, except these are Cisco phones, which can generally go where you go if your Jive contact comes to an end. Cisco is also probably the best name you can trust in hardware, right there with Polycom. Specifically, Jive lists that they will be adding the 7811, 7821, 7841, 7861, 8811, 8841, 8851, and 8861 phones to their service, which means Cisco has built out some specific Jive Communications firmware to best utilize and leverage the devices with the provider’s Cloud network. For some more technical information, both the 7800 and 8800 series bring with them a solid list of primary benefits. State of the art microphone and speaker technology, and wideband audio voice communications, which helps to deliver exceptional voice clarity. Advanced features, such as integration with personal mobile devices, which help enable mobility, and more flexible ways of working. 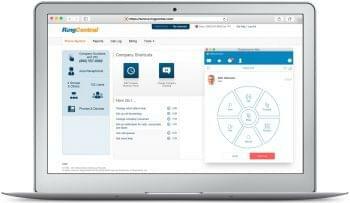 One-button dialing and expanded status detail with key expansion modules simplify call management for administrative and executive staff. 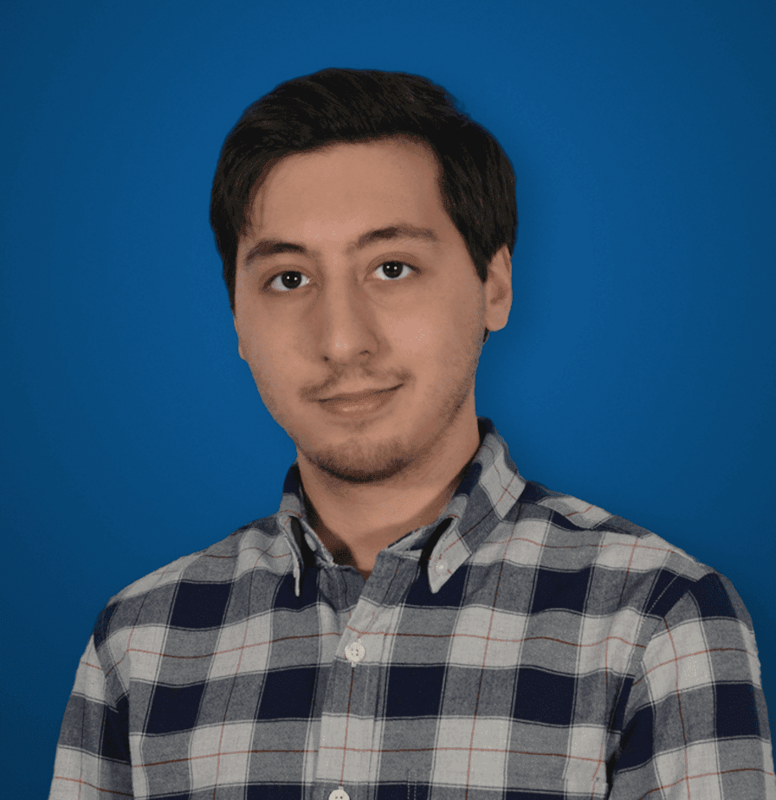 I recently wrote an in-depth explanation of integrations, the APIs that power them, and why integrations play such a crucial roll in both solutions, and business strategies. So, with a rise in integrating and connecting solutions, opening up new revenue streams, and new methods of communication, it only makes sense that we can integrate say, our desk phones to our smart phones. 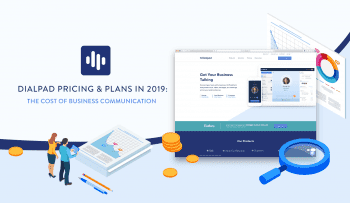 With BYoD becoming such a major trend for just about every business of every size, and mobility as a key aspect of what makes Unified Communications so powerful, further connectivity is only a good thing. If you can integrate your desk and smart phone, then you can receive the same texts, calls, voicemails, conferences, and transfers anywhere you go. More interestingly, you can seamlessly transition calls from one phone to the other. Think of this integration as the “call me anywhere” feature, but on steroids. Overall, in a world of increasingly connected hardware, and Unified Communications, it only makes sense that we unify all of our phones. Just look at how scary, yet important IoT is becoming. So what does this mean for Jive customers? Well, you now have even more choices if you are an existing user, which means these start of the art multiplatform phones. If you’re not an existing Jive client, then well, this might just be more reason to switch over. After all, we did list them as one of our top 6 Nextiva Alternatives.